Physical exam. Your doctor will look in your ear for possible causes of your hearing loss, such as earwax or inflammation from an infection. Your doctor will also look for any structural causes of your hearing problems. General screening tests. Your doctor may use the whisper test, asking you to cover one ear at a time to see how well you hear words spoken at various volumes and how you respond to other sounds. Its accuracy can be limited. App-based hearing tests. Mobile apps are available that you can use by yourself on your tablet to screen for moderate hearing loss. Tuning fork tests. Tuning forks are two-pronged, metal instruments that produce sounds when struck. Simple tests with tuning forks can help your doctor detect hearing loss. This evaluation may also reveal where in your ear the damage has occurred. Audiometer tests. During these more-thorough tests conducted by an audiologist, you wear earphones and hear sounds and words directed to each ear. Each tone is repeated at faint levels to find the quietest sound you can hear. 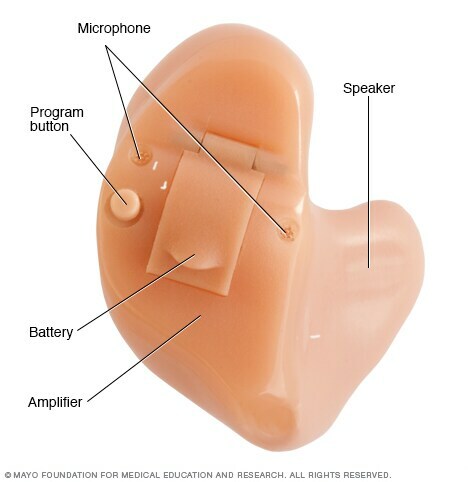 Hearing aids use these parts to help channel and amplify sound from your environment into your ear — microphone (detects sound), amplifier (makes sound stronger), speaker (sends sound into your ear), battery (provides power). Some also have a volume control or a program button. 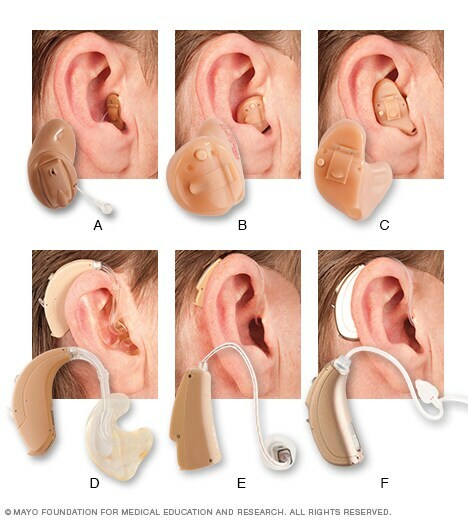 Many choices of hearing aid styles are available, including: completely in the canal (A), in the canal (B), in the ear (C), behind the ear (D), receiver in the canal or receiver in the ear (E), and open fit (F). 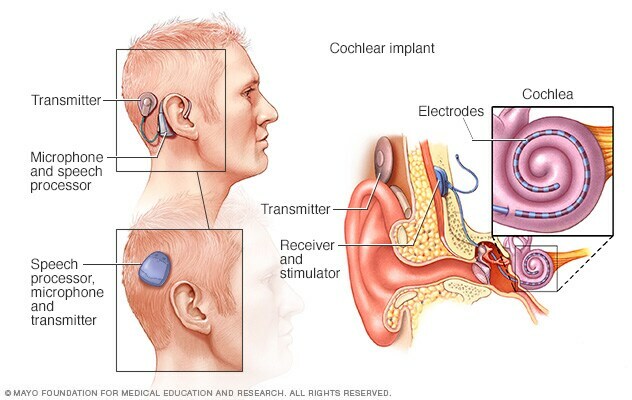 Cochlear implants use an external microphone and speech processor that you generally wear behind your ear. Different styles are available. A transmitter sends radiofrequency signals to a surgically implanted receiver and stimulator unit. The unit stimulates the auditory nerve with electrodes that have been threaded into the cochlea. Removing wax blockage. Earwax blockage is a reversible cause of hearing loss. Your doctor may remove earwax using suction or a small tool with a loop on the end. Surgical procedures. Some types of hearing loss can be treated with surgery, including abnormalities of the ear drum or bones of hearing (ossicles). If you've had repeated infections with persistent fluid, your doctor may insert small tubes that help your ears drain. Hearing aids. If your hearing loss is due to damage to your inner ear, a hearing aid can be helpful. An audiologist can discuss with you the potential benefits of a hearing aid and fit you with a device. Open fit aids are currently the most popular, due to fit and features offered. Cochlear implants. If you have more severe hearing loss and gain limited benefit from conventional hearing aids, then a cochlear implant may be an option. Unlike a hearing aid that amplifies sound and directs it into your ear canal, a cochlear implant bypasses damaged or nonworking parts of your inner ear and directly stimulates the hearing nerve. An audiologist, along with a medical doctor who specializes in disorders of the ears, nose and throat (ENT), can discuss the risks and benefits. Dr. Hogan: "Hearing aids, because they're digital, can be adjusted over a wide range of hearing loss." That's one reason why audiologist Dr. Cynthia Hogan says with these devices, one-size-fits-all does not apply. Dr. Hogan: "So there isn't one best hearing aid for older people versus younger people. We try to choose a hearing aid that's going to fit the person's needs." Important decisions include whether the device will have rechargeable batteries or ones that need to be replaced, and whether the hearing aid will sit behind or in the ear. Dr. Hogan: "This is a full-shell, in-the-ear hearing aid. And, so, it fits all into the ear." One of the benefits of this device is wearers can answer and listen to a phone call as they have their whole life. Some hearing aids can even connect to a person's cellphone. Dr. Hogan: "They can watch videos or things like that directly from their phone to their hearing aid." An audiologist like Dr. Hogan can help you sort through all the options and create a personal solution for your hearing problem. For the Mayo Clinic News Network, I'm Jeff Olsen. Tell your friends and family. Let them know that you have some hearing loss. Position yourself to hear. Face the person you're talking to. Turn off background noise. For example, noise from a television may interfere with conversation. Ask others to speak clearly, but not more loudly. Most people will be helpful if they know you're having trouble hearing them. Try to have the other person's attention before speaking. Avoid trying to converse with someone in a different room. Choose quiet settings. In public, choose a place to talk that's away from noisy areas. Consider using an assistive listening device. Hearing devices, such as TV-listening systems or phone-amplifying devices, smartphone or tablet apps, and closed-circuit systems in public places can help you hear better while decreasing other noises around you. If you suspect you may have hearing loss, call your doctor. After an initial evaluation, your doctor may refer you to a hearing specialist (audiologist). Nieman CL, et al. Otolaryngology for the internist: Hearing loss. Medical Clinics of North America. 2018;102:977. Weber PC. Etiology of hearing loss in adults. https://www.uptodate.com/contents/search. Accessed Dec. 27, 2018. Age-related hearing loss. National Institute on Deafness and Other Communication Disorders. https://www.nidcd.nih.gov/health/age-related-hearing-loss. Accessed Jan. 1, 2019. Jameson JL, et al., eds. Disorders of hearing. In: Harrison's Principles of Internal Medicine. 20th ed. New York, N.Y.: The McGraw-Hill Companies; 2018. https://accessmedicine.mhmedical.com. Accessed Dec. 27, 2018. Noise-induced hearing loss. National Institute on Deafness and Other Communication Disorders. https://www.nidcd.nih.gov/health/noise-induced-hearing-loss. Accessed Jan. 1, 2019. Decibel levels. Hearing Health Foundation. https://hearinghealthfoundation.org/decibel-levels?gclid=EAIaIQobChMI6seW4KvO3wIVlohpCh3L1AMKEAAYASAAEgKsQPD_BwE. Accessed Jan. 1, 2019. Occupational noise exposure. Occupational Safety & Health Administration. https://www.osha.gov/laws-regs/regulations/standardnumber/1910/1910.95. Accessed Jan.1, 2019. Weber PC. Evaluation of hearing loss in adults. https://www.uptodate.com/contents/search. Accessed Dec. 27, 2018. Morrow ES Jr. Allscripts EPSi. Mayo Clinic, Rochester, Minn. Jan 2, 2019. Saliba J, et al. Accuracy of mobile-based audiometry in the evaluation of hearing loss in quiet and noisy environments. Otolaryngology–Head and Neck Surgery. 2017;156:706. Hearing loss. Merck Manual Professional Version. https://www.merckmanuals.com/professional/ear,-nose,-and-throat-disorders/hearing-loss/hearing-loss. Accessed Dec. 27, 2018. Cunningham LL, et al. Hearing loss in adults. New England Journal of Medicine. 2017;377:2465. Hearing loss and older adults. National Institute on Deafness and Other Communication Disorders. https://www.nidcd.nih.gov/health/hearing-loss-older-adults. Accessed Jan. 1, 2019. AskMayoExpert. Idiopathic sudden sensorineural hearing loss. Rochester, Minn.: Mayo Foundation for Medical Education and Research; 2018. Driscoll CLW (expert opinion). Mayo Clinic, Rochester, Minn. Jan. 15, 2019. Deal JA, et al. A randomized feasibility pilot trial of hearing treatment for reducing cognitive decline: Results from the Aging and Cognitive Health Evaluation in Elders Pilot Study. Alzheimer's & Dementia: Translational Research & Clinical Interventions. 2017;3:410. Whitson HE, et al. American Geriatrics Society and National Institute On Aging Bench-to-Bedside Conference: Sensory impairment and cognitive decline in older adults. Journal of the American Geriatrics Society. 2018;66:2052. High-frequency hearing loss: Can hearing aids help? Mayo Clinic Minute: What is hearing loss? Cochlear implants: Who are they for?